"Ontario Highway 100" redirects here. For the original designation, used from 1941 to 1962, see Ontario Highway 19. For other roads with this name, see Veterans Memorial Highway. Intersection along the Veterans Memorial Parkway. Flagpoles along the southbound lanes of Veterans Memorial Parkway near the Highway 401 interchange. London endured a long debate about in-city freeway connections through the city and west to Sarnia, through the 1960s. Repeated debates moved the links into and out of the city limits, and considered numerous options that either cut through existing neighbourhoods or were routed further out from the city center. The road would connect to Highway 401 in the south and join up with Highway 402 in the west. This plan, however, never came to fruition due to city council's reluctance to fund an urban freeway. When city council became more united in opposition to Highway 402 being routed through London, the highway now known as Veterans Memorial Parkway was conceived by the Ontario government as a compromise: a spur highway that would run along the eastern parts of London. The City of London and the province decided that the proposed road would be constructed as a two-lane highway from Highway 401 north to Oxford Street. Designed as a super two, the design included a 250-metre-wide (820 ft) right-of-way so that an additional carriageway could be built in the future. As well, the road would be designated as Highway 100 and named Airport Road. The road featured traffic lights at intersections, with available land to build interchanges if warranted. The Hanlon Parkway (also known as Highway 6 North) in Guelph was built around the same time and had similar features as Airport Road, including the same overpass contractors for their trumpet interchanges with Highway 401, and at-grade intersections, although the Hanlon was opened as a four-lane divided road. Construction on Airport Road began in early 1975, with its official opening in 1977. The road was opened to traffic as far as Dundas while the final portion to Oxford was completed. The Ministry of Transportation downloaded the highway to the city of London and the County of Middlesex in 1994, but has maintained the road as a connecting link. In 1997, the road was extended further north from Oxford to Huron Street. In 2004, the City of London began to widen Airport Road from Highway 401 north to Oxford Street, using the right-of-way to construct another carriageway separated by a grass median. The completion of the project resulted in a four-lane, divided highway with room for future interchanges and overpasses, similar to that of the Hanlon Parkway. The widening was completed in late 2005. In September 2006, the road was renamed Veterans Memorial Parkway as a tribute to Canadian veterans (from World War I, World War II and the Korean War). During 2010, the Parkway underwent a beautification project. This included a large gateway monument which was installed on the northbound lanes near the Highway 401 interchange, greeting motorists entering the expressway, planting trees along the entire length of the expressway, and raising flagpoles in tribute to Canadian veterans. In 2016, the Parkway underwent construction which included extending the southern terminus to Wilton Grove Road and converting the Highway 401 interchange to a 4-way interchange. The interchange project was completed in November 2017. London's original ring road was initially planned to be Highbury Avenue, also known as Highway 126, which was opened in 1963. Its exit with Highway 401 is the next one west of Veterans Memorial Parkway. Local opposition resulted in Highbury Avenue's truncation at Hamilton Road. The City of London has short-term plans to extend Veterans Memorial Parkway to connect with Clarke Road near the Fanshawe Conservation Area. 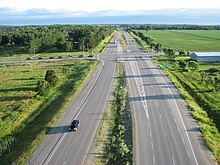 Also, extending Veterans Memorial Parkway south of Highway 401 to Highway 3 in St. Thomas remains a future possibility. Widening the road between Oxford Street and Huron Street / Robin's Hill Road is also in the city's short term transportation objectives. An environmental study is underway to reconstruct the three-way trumpet interchange with Highway 401 into a four-way interchange that would connect the expressway to Wilton Grove Road and potentially as far south as St. Thomas. In 2007, the City of London conducted an environmental assessment on potential interchange locations to be built along Veterans Memorial Parkway. These plans are within a 10-20 year time frame. The City of London conducted a long-term transportation corridor protection study in 2001 and noted that the Veterans Memorial Parkway (then Airport Road) would serve as the city's eastern expressway when the city reaches its projected full build-out potential. Long-term plans call for Veterans Memorial Parkway to be included as the eastern leg of a future London Ring Road. These proposals have been discussed since the 1960s and recently have been revived. The eastern corridor for a ring road would use Veterans Memorial Parkway in the east, then continue north along Clarke Road. A western link would start at Highway 402 and head north between Westdel Bourne Road and Woodhull Road. The northern corridor is a major stumbling block since the lands needed within the city limits have been developed. The only available route possible would be outside of the city in Middlesex Centre. Although talks continue between both municipalities, only the province can approve the plan. Even if a route for the highway is selected soon, it would not likely be built for 20–30 years. The City of London has assessed the entire length of the Veterans Memorial Parkway, identifying areas where interchanges can be constructed, grade separations can occur, and cul-de-sacs (replacing previously at-grade intersections for minor surface roads) can be placed. These changes would upgrade the Veterans Memorial Parkway from a partial control-access expressway to a fully controlled-access freeway for the majority of its length. ^ Green, Doug (October 16, 2006). "Commencement of the Veterans Memorial Parkway Interchange Class Environmental Assessment and Concurrent Notice of Application to Amend the Official Plan & Zoning By-Law". Archived from the original (PDF) on December 17, 2010. Retrieved November 5, 2010. The City of London proposes to identify interchange locations along the entire length of the Veteran’s Memorial Parkway (formerly Airport Road) corridor. ^ "Transportation Master Plan" (PDF). City of London. May 2004. Retrieved November 30, 2010. 2004 Approved Capital Project: Airport Road widening from 2 to 4 through lanes with new bridge over Thames River and CP Rail, between Highway 401 and Oxford Street. ^ "Veterans Memorial Parkway Dedication Ceremony". City of London. September 15, 2006. Retrieved November 5, 2010. London's Airport Road was officially renamed Veterans Memorial Parkway in a City ceremony held September 15, 2006. ^ Mathyssen, Irene (April 9, 2010). "Making Veterans Memorial Parkway a Fitting Tribute to Our Veterans". Retrieved November 8, 2010. It was quite a sight to see hundreds of volunteers on both sides of the Parkway planting 1,000 trees. An additional 2,000 trees and shrubs were planted in parks throughout the city. ^ "Veterans Memorial Parkway site of flag-raising salute to Canadian Veterans". City of London. November 5, 2010. Retrieved November 8, 2010. Today’s ceremony included a flag party march, the raising of federal, provincial and territorial flags. ^ "Flag Raising Salute to Canadian Veterans". Elgin Central. November 5, 2010. Retrieved November 8, 2010. honoured Canadian veterans today at the unveiling of a permanent display of flags on one section of the Veterans Memorial Parkway. ^ nurun.com. "VMP expansion completed". The London Free Press. Retrieved 2017-11-13. ^ "Transportation Master Plan" (PDF). City of London. May 2004. Retrieved November 30, 2010. Airport Road widening from 2 to 4 through lanes from Oxford Street to Huron Street. ^ Transportation division (November 13, 2007). "Veterans Memorial Parkway, Environmental Study, Official Plan and Zoning Amendment" (PDF). City of London. Archived from the original (PDF) on December 17, 2010. Retrieved April 26, 2010. Veterans Memorial Parkway: Preferred Alternative to Highway 401/VMP interchange. ^ Transportation division (May 30, 2007). "Veterans Memorial Parkway, Interchange-class environmental assessment study" (PDF). City of London. Archived from the original (PDF) on December 17, 2010. Retrieved April 26, 2010. Reformatting the Highway 401/VMP interchange. ^ a b "Veterans Memorial Parkway Interchange Class Environmental Assessment Study and Concurrent Application to Amend the Official Plan and Zoning By-Law" (PDF). City of London and Giffels. December 13, 2007. Archived from the original (PDF) on 21 March 2012. Retrieved November 5, 2010. The freeway design will reduce the congestion on the road network and improve overall safety while maintaining shorter travel time along the entire corridor to full build out conditions. ^ "London Long Term Transportation Corridor Protection Study" (PDF). City of London. April 5, 2001. Archived from the original (PDF) on June 21, 2011. Retrieved November 30, 2010. This study recommends the City protect for a four lane expressway facility along Airport Road from Highway 401 to Sunningdale Road. ^ Cornies, Larry (November 6, 2010). "Ring Road Around London Still a Dream". Retrieved November 8, 2010. city politicians have tried a few times to revive the ring-road concept, but were twice foiled by the Ontario Municipal Board. This page was last edited on 10 March 2019, at 16:38 (UTC).